It was a sunny but cool afternoon by the Main river in a tiny village near Würzburg, Germany. I’d had my first taste. I was awakened. The love affair had started. But the story really started around Christmas of 2005 in the island of Villamendhoo in the Maldives. My husband (we weren’t yet married then) and I were seated with a German couple, Moni and Wolfgang, for our meals. We sat together, the four of us, for every breakfast, lunch and dinner for two weeks. We had a lot of fun and celebrated that New Year’s eve together in style. I lived in Germany at the time and went to visit them one weekend in the spring of 2006. Wolfgang’s family owns a winery in that little village where I fell in love. In love with German wine. 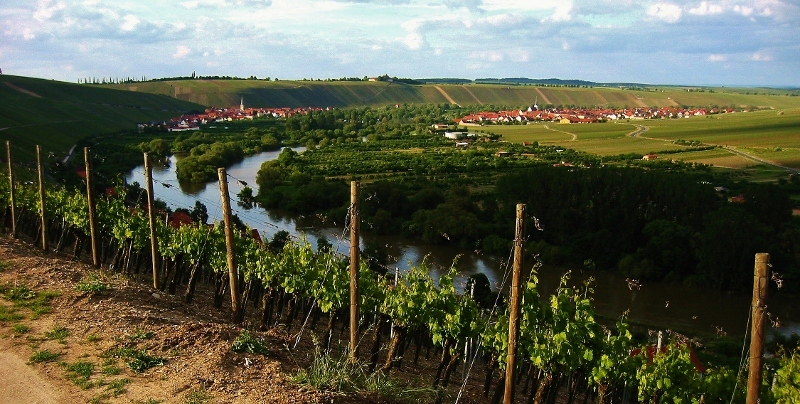 This region of Franconia (Franken in German) is known for its lively wines that are full of minerality. Franconia produces some of the best quality German wine. It is also known for its Bocksbeutel (see picture below) shape of bottle which is protected in the EU. Müller-Thurgau, Silvaner (Sylvaner in German), Bacchus, and Riesling are all grapes that grow well in this region. We’d just had a hearty brunch before walking a few doors down to the winery (I think it was this one or close to it anyway). They had a large picnic bench set up on the opposite side of the street and close to the Main. The conversation and the wine flowed. Moni and Wolfgang were great hosts that weekend and on subsequent visits. Sadly the number of bottles of wine I could carry back was limited as I had to lug them back home by train to Cologne. But what I did carry away was my love for German wine and an understanding of the German classification system for Riesling. The classification system for Rieslings helps a lot in deciding what wine to buy especially if you are trying to pair it with food or don’t care for ‘sweet’ wine. The further down on the list, the later the riesling grapes are harvested, and the sweeter and more expensive they get in general. Table wine (Tafelwein) & Land Wine (Landwein) are harvested the earliest and have the lowest residual sugar. They are the lowest quality and very affordable so that anyone is able to drink it. Though they are said to be ‘low’ quality, they are very drinkable wines and are on the ‘bone-dry’ end of the Riesling spectrum. These wines are typically consumed regionally and almost never exported. Kabinett – the grapes are harvested a little bit later. This is great wine for pairing with food. Even spicy food. And if you think you don’t like Rieslings because they are too sweet, try Kabinett Riesling. You will be surprised. Spaetlase (pronounce schpate-lay-zuh) while this wine can still be dry and acidic, it has more residual sugar than the above. 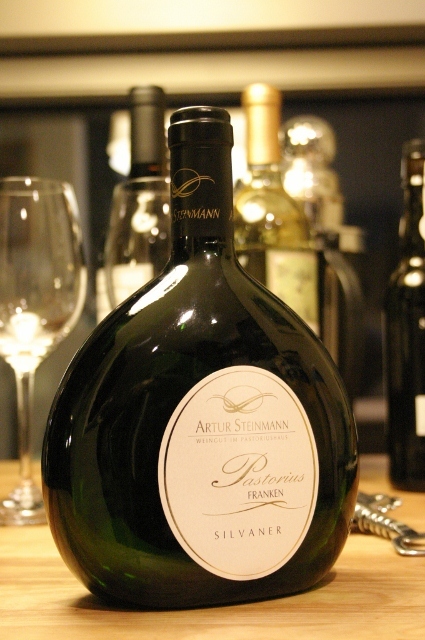 Auslese (pronounce ous-lay-zuh) – you start noticing the sweetness from the higher residual sugar at this level. But it is still a well-balanced wine with hints of acidity. Beerenauslese (bear-en-ous-lay-zuh) – only made in a vinatge that produces a lot of grapes and the best ones can be selectively picked. Trockenbeerenauslese (troh-ken-bear-en-ous-lay-zuh) – the picked grapes are dried and very little can be extracted from them but the flavors are intense. Eiswein (Ice Wine) – here the grapes are left on the vine till the first frost and are then hand-picked. Expect to pay $$ for a decent bottle of this dessert wine. So if you are looking at German wines at a store and trying to find a Riesling that will pair well with food, your best bets are Kabinett, Spaetlese or Auslese. The higher residual sugar in the Auslese is particularly good for contrasting the heat in an Indian or Thai curry. While Washington State produces great Rieslings, they are not labeled with the above classifications. And you have to experiment or go with a wine you’ve had before. Silvaner wines are also fantastic for pairing with food but are much harder to find in the US. I’m told Bacchus wines should pair well with Asian food but haven’t had a chance to test this personally yet. Gewurztraminers are easily found in the US and pair well with dishes. Watch out for a couple more wine related posts. I’ll be sharing my German mulled wine recipe and general tips for selecting wine with spicy food before the winter is over. 1. Müller-Thurgau grapes were developed by Professor Müller from Thurgau, Switzerland and are a cross between Riesling and Madeleine Royale grapes. This grape grows well along the Puget Sound and Oregon coast. 2. Rivaner is another name for Müller-Thurgau. 3. Bacchus grapes are a cross between a Riesling-Silvaner cross and Müller-Thurgau. 4. The letters ä, ö, ü are pronounced as ‘ae’, ‘oe’ & ‘ue’. They can also be written out as such which is useful if you don’t have a German keyboard. The double dots are called ‘umlaut’. 5. If you do find yourself in Bavaria and close to Würzburg, I’d recommend renting bikes and cycling around the country side in addition to wine tasting! Many wineries also have a couple of rooms to rent. 6. The Rhine and Mosel valleys also produce fantastic wine. I would also recommend visiting this area. You can cruise down the Rhine and stop off at villages to visit castles and go wine tasting as well. The many castles atop hills along the river make for a very picturesque tour. 6. Germany also makes many red wines like Spaetburgunder (Pinot Noir) and Dornfelder. I didn’t mention them in the post for brevity and because I’m more interested in German whites. 7. In my experience in Germany, ordering bottled water at a restaurant is typically more expensive than ordering beer or many wines! I have Egypt on my mind. While Egyptians have risen up like a tsunami that will not abate until it has destroyed the Mubarak regime in its wake, all I can do is follow the news. While history is being made on the streets of Cairo and Alexandria, all I can do is write about my favorite Egyptian street food. But Egypt is also on my mind for another reason. 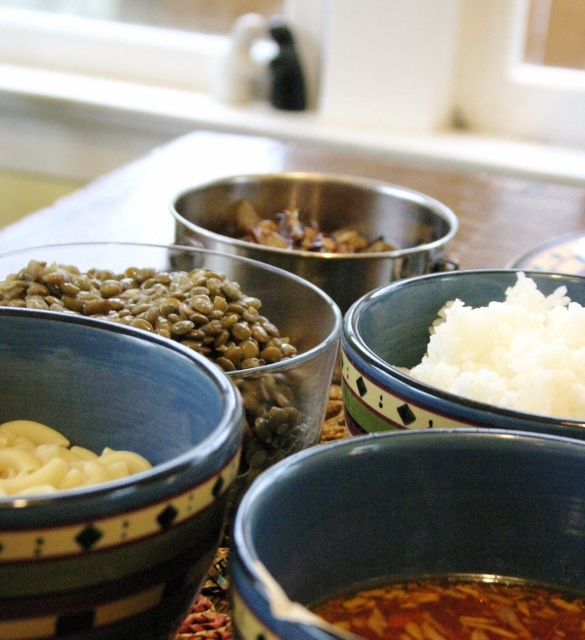 The pictures below are from three weeks ago when my Egyptian friend Yasmin invited a few of us to lunch to learn how to make Koshary just a few days before she was about to leave for Egypt for a month-long vacation. A few hours ago, she posted a quick note on Facebook to let us know that she is fine. Relieved, it struck me how today events around the world affect me in a much more personal way than even ten years ago. And in my small way, writing this post inexplicably makes me feel closer to the people of Egypt. Koshary is one of the ultimate street foods. Just like Egyptians from many walks of life have come together to create the perfect storm of a protest, the many layers in this humble dish come together to make a very satisfying dish. It is affordable, filling and fairly healthy though loaded with carbs. While the various ingredients take time to assemble, it is simple to make. Rather than the pyramids or the sphinx, this dish is one of my favorite things from my trips to Egypt. There are many recipes for Koshary and some include toppings that others don’t. It is up to you to decide which of the toppings to include although I highly recommend keeping all of them. Koshary is typically served with a tomato sauce and a garlic sauce. Yasmin combined the two sauces for ease. This recipe serves 4. 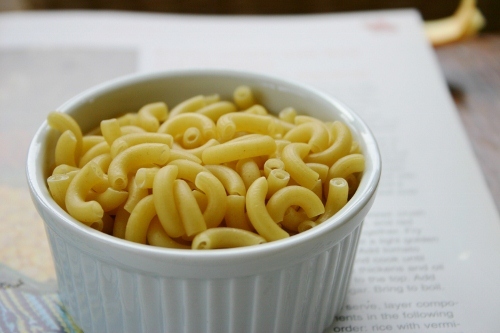 The various ingredients could be prepared ahead of time and brought to room temperature or warmed before serving. 1. Place rice in a pot. Rinse the rice 3 times and drain. Add 1 and 3/4 cups of water. Bring to boil, lower heat to medium-low and cover pot with lid. Cook for 20 minutes or till rice is soft and tender. Keep lid on for another 5 minutes. 2. Place the lentils in another pot. Rinse and pick out stones or other impurities. Add 3 cups of water and a pinch of salt and bring to a boil. Lower heat to medium-low and cover pot with lid ajar. 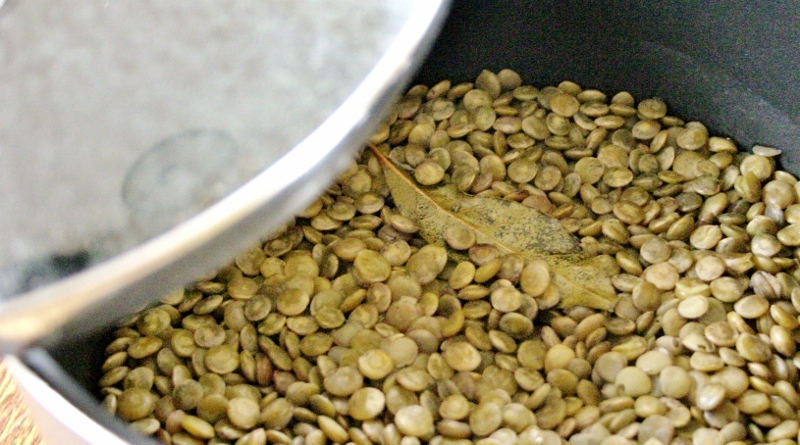 Cook for 20 minutes or till lentils are cooked and soft but still retain their shape. 3. Follow manufacturer’s instructions on pasta package to cook it. 4. Slice the onions very thinly (thinner than in the picture). Heat 4 tablespoons oil in a large skillet over medium-high heat. Add the onions and 1/4 teaspoon salt (helps to cook the onions faster). Stir occasionally. Turn the heat down to medium once the onions start browning. Saute till nicely brown and well caramelized. This step takes some time and requires patience. 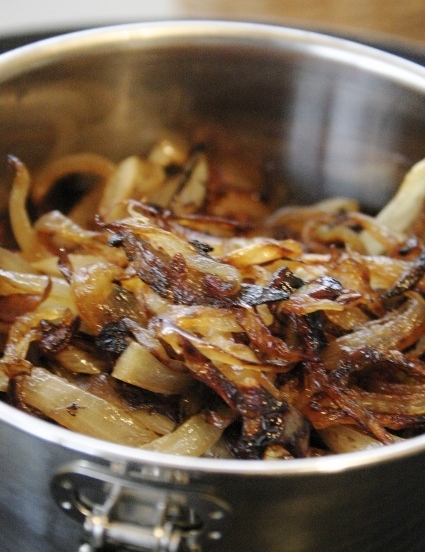 To speed this step up, consider dividing the onions and cooking in two skillets. 5. Peel and mince the garlic. Break the red chili into 3 or 4 smaller pieces. Grind the garlic and red chili using a mortar and pestle. Heat 2 teaspoons oil in a saucepan over medium heat. Add the crushed garlic, chili and the cumin powder. Stir regularly while sautéing for 30 seconds to release all the flavor. Add the tomato paste and stir for another 30 seconds. Add the vinegar and 1 cup of water. Bring to a simmer, reduce heat to low and cook for another 10 minutes. Add 1/2 – 1 teaspoon salt or to taste. Keep in mind that the sauce should be a bit on the saltier side as it will provide the flavor for the rice, pasta, chickpeas and lentils. 6. Place all the ingredients into individual bowls. Make your koshary by adding the ingredients in layers on your plate or bowl. 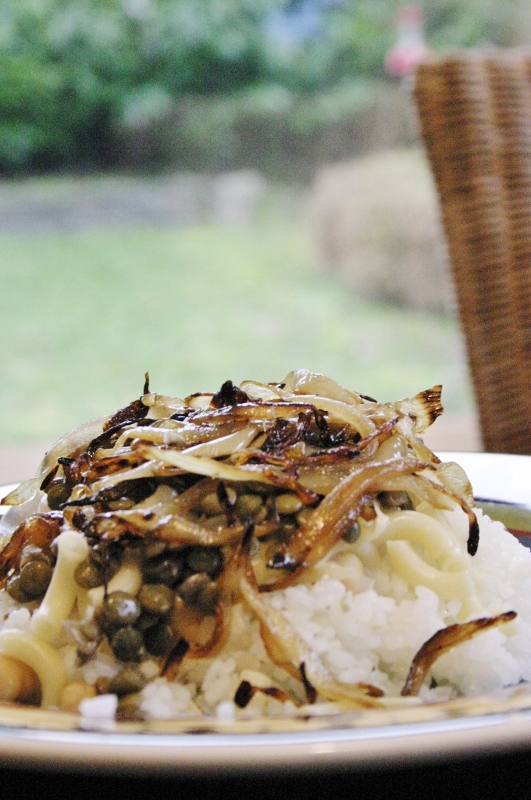 Start with the rice and macaroni, and then add the chickpeas and lentils and finally garnish with the onions. Sprinkle sauce over your dish. Mix it all up or enjoy the various textures of this amazing dish separately. 1. Although the texture will be different, you could substitute brown rice for the white rice. Many recipes call for long grain or basmati rice. 2. Use what rice you wish but the more traditional recipes seem to call for short grain rice. If you use a different rice, please note that the ratio of water to rice will vary. 3. If you find legumes difficult to digest, add a piece of kelp seaweed or kombu while cooking. The kombu softens the legumes and makes them easier to digest. Even if you use canned chickpeas, soak them in some water and kelp before draining and using. Finally enjoy this dish with family and friends. Keeping my fingers crossed for a smooth transition to a government of the people in Egypt. 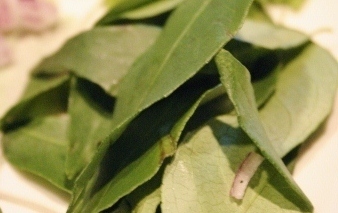 The intoxicating smell of fresh curry leaves in hot oil wafted around corners and into the bedroom where I was trying to sleep off the flu but was instead tired and cranky. The aroma of freshly roasted semolina hung around the kitchen inviting me to peek in. I just had to get out of bed and go get the camera. It was right after Christmas. I was at my mom’s and she had been busy cooking. 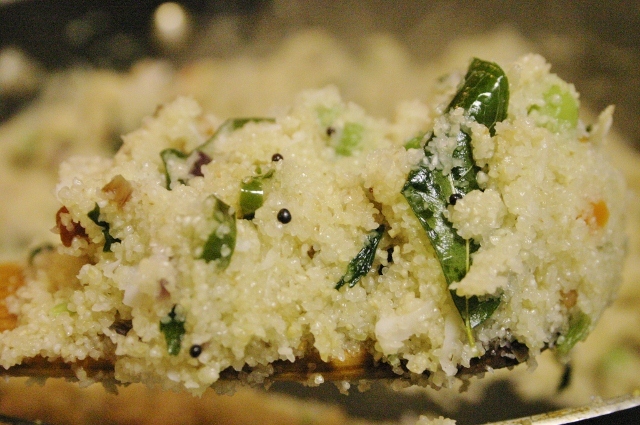 My mom’s ‘upma’ (also known as uppittu in Kannada, my mother tongue) is one of those memory triggering foods. Others made their upma too soft and mushy. Her’s always had a much more interesting texture. 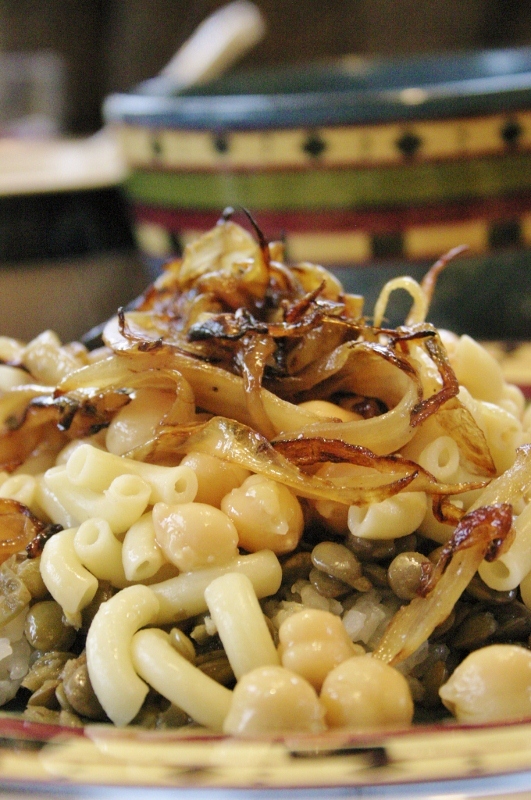 The lentils in the dish get crunchy when fried in oil and add greatly to the texture. But for some reason, my brother didn’t like anything crunchy. So if mom added the lentils, he didn’t like it and if she didn’t add them, I complained! Poor mom. This time though, he said it was OK (I asked nicely) which was very nice of him. We fought over the silliest things when we were kids! I dug in eagerly, savoring the flavors and appreciating the crunchiness of the lentils contrasted with the moistness of the semolina. I’m sure the upma helped me get over the flu. Upma though is great anytime whether you’re ill or not. It is truly South Indian soul food. There are many upma recipes online but I wanted to share my mom’s recipe as a couple of things have been simplified. 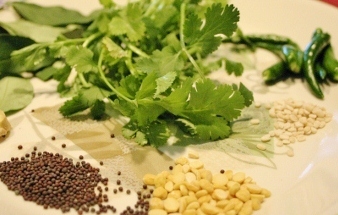 The ingredients can be found in an Indian or Asian grocery store. Many of them can also be found at Whole Foods. 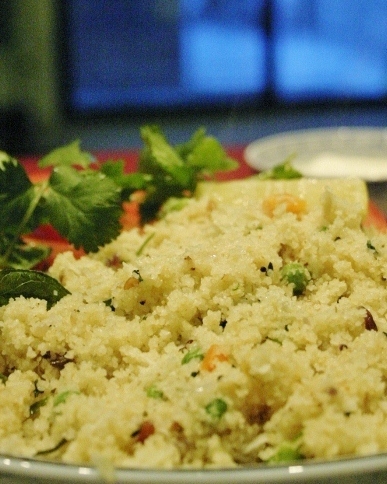 My mom was happy to share her recipe for upma with you. Here it is. I hope you get to make it sometime soon! Heat the water over medium heat high and bring to a boil. Add the peas and carrots. Let cook for 2-3 minutes. While waiting for the water to boil, proceed to the next step. 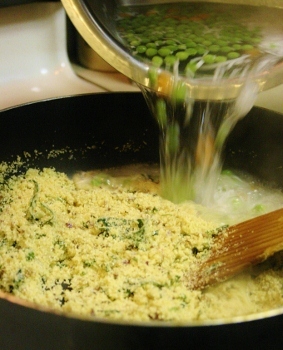 Heat the oil in a large skillet (should hold the semolina and the water) over medium heat. You know the oil is hot if you drop in a mustard seed and it sizzles. Add the curry leaves, urud dal and chilies and stir constantly to prevent from burning. Saute for 10 minutes. Then add the semolina or couscous. Fold in with the oil and spices and roast for two minutes. 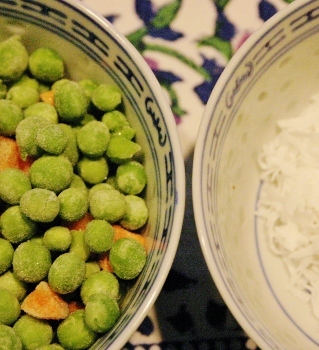 Pour in the boiling water with the cooked peas and carrots. Stir to break up any lumps that may form. The semolina should be cooked in 2-3 minutes. The couscous may take a minute longer. Serve hot with yogurt onthe side. You can mix the upma with yogurt if it is too spicy. Back in 2001, I was fortunate enough to celebrate New Years in Japan with my friend’s family at her grandmother’s house in a small village near Himeji Castle. The whole family had gathered – caring and curious aunts and uncles, friendly cousins, and adorable little nephews and nieces. The kitchen was a beehive of activity with grandmother running the show. Being guests, we weren’t allowed to help and we’d probably only have been in the way anyway. As the evening got colder and the clock inched closer to midnight, we overcame the initial shyness with the couple of words of Japanese we knew, our hosts’ smattering of English, and lots of good cheer. When we finally sat down to dinner, we needed five tables to accommodate everyone. My friend’s mother, grandmother and aunts had prepared an amazing spread. I’ll confess that with the many years that have since passed, I don’t exactly remember all the dishes we ate. I do remember my favorite was the wild boar nabe. After the feast, my friend’s father took us to the family shrine to ring the bell and bring in the new year. I will never forget how lucky I felt to have been a part of a Japanese family for that celebration. Every new year, I crave nabe and many of the other Japanese dishes that we had on that trip and I think of my friend and her family. Once I even made okonomiyaki and gomae (spinach salad with sesame seeds) as part of the new year’s eve dinner. So you can imagine my pleasure when I received a surprise package from this dear friend a couple of months ago. She sent me a book of Bashō’s haiku, Harumi’s Japanese Cooking and the most encouraging note ever. It totally made my day. I’ve been meaning to use my new cookbook ever since. She also sent me The Narrow Road to the Deep North and Other Travel Sketches, a compilation of haiku by Matsuo Bashō, a Japanese poet born in 1644. He wrote this haiku upon meeting an old friend he hadn’t seen for twenty years. It is one of my favorite. Carefully remove the tofu from its packaging while trying to keep it intact. Let excess water drain and cut into 4 big pieces. Place a piece of tofu on each of four plates and scoop out about a wide tablespoon from the top of each piece. 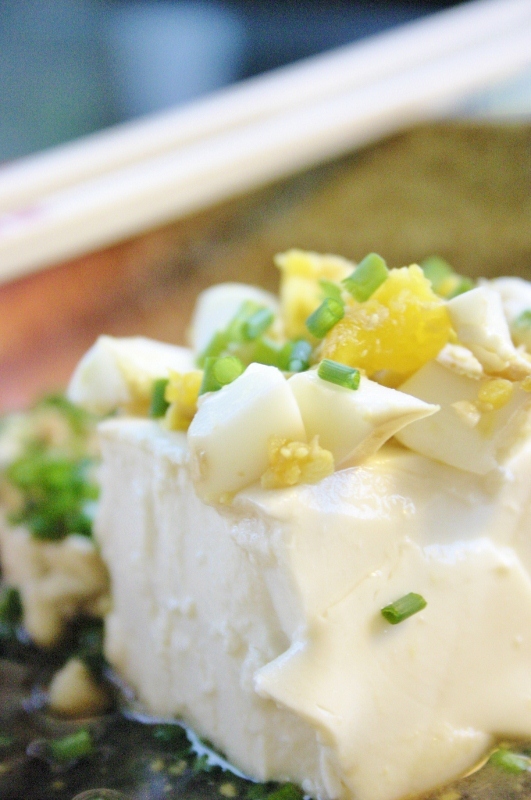 Crack an egg and carefully empty the white and yolk into the hollow of each piece of tofu. Arrange the previously scooped out tofu on the side. 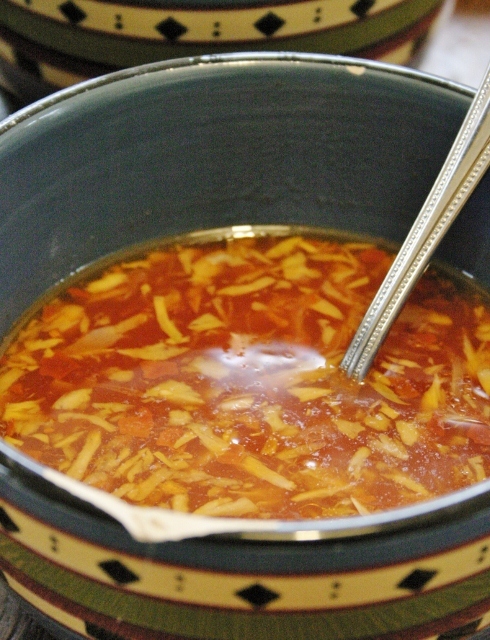 Place some grated ginger on top and garnish the dish with the chives. Pour the dressing over the tofu before serving. My verdict? The dish was simple, yet elegant, subtle yet smooth and flavorful. Photo credit - Lee Sam. Used under Creative Commons license. Ever walked in to an Indian restaurant and then waddled out an hour or so later? For me, this happens almost every time. I feel like Eve discovering the proverbial Apple on almost every line of the restaurant menu. With many Indian food babies under my belt (or is it over? 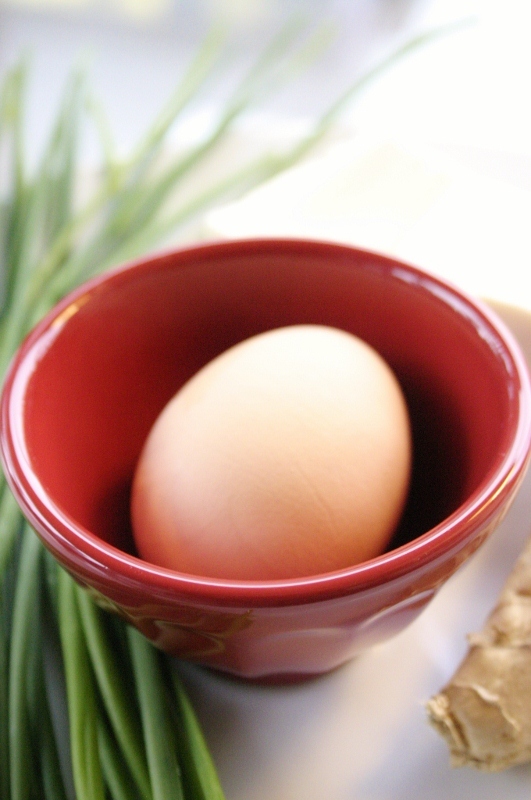 ), I have a few tips to share for those resolving to eat healthier this new year. But if you’re one of those people who can eat and eat and eat without gaining a pound; firstly, I’m jealous and secondly, don’t bother reading on. So it’s the new year and you’ve resolved to eat healthy and/or lose a few pounds. Follow these common sense tips* (disclaimers below) to continue to enjoying your favorite Indian restaurant while staving off the pounds. DO ask if you can get pappadums that are microwaved rather than fried. DO order tandoori roti instead of naan as its made with unleavened whole wheat. If they smear on butter, ask them to leave it off. DO enquire if brown rice is an option. Brown basmati rice is becoming widely available nowadays. DO order at least one healthier dish if ordering more than one. Daal or saag (minus paneer and when cream not added) are yummy and healthy too. If the restaurant has vegan options, select one dish that is vegan to avoid excessive cream and butter. DO order tandoori chicken or chicken tikka. They are marinated with yogurt and spices and cooked in a clay oven – relatively healthy. DONT order rich Mughlai curries. This cuisine developed in the kitchens of the Mughal emperors are made to befit a royal table. Though deservedly alluring whether you’re of royal blood or a commoner, curries made mughlai style are laced with cream. Avoid if possible. DON’T order anything with korma in the name or dishes like butter chicken, tikka masala, and malai kofta. I know, they’re yummy but they’re also laden with cream and thus lots of calories. DO order spicy food if you can take it. The heat will kick your metabolism into gear. A vindaloo is a great option. It’s spicy and there is no cream in the gravy. But please don’t set your throat on fire. I’ll feel really bad. DON’T order desserts or if you do, share. Indian desserts are rich and sweet. All that sugar will convert to fat in your body if you don’t burn the calories right away. DO end your meal with finishing up a side of yogurt. It will cool your stomach down and with its probiotic powers will help digest that yummy meal you’ve just had. So there you have it. To summarize the entire post in three words: avoid cream curries. Does this help? Other tips you can think of? While I’m advocating making healthier choices, I know it’s all about balance. So go ahead, indulge a bit if you must. And then consider walking home. 1) I’m NOT a nutritionist. 2) There is a lot of variation in menus and in how restaurants might choose to prepare these dishes. For example, some restaurants choose to add cream to saag while others don’t.